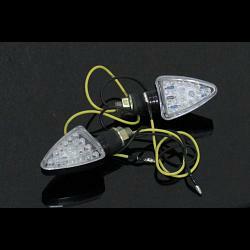 Mini LED turn signal lamps. Universal fitting. Bright but small and discrete, these units are easy to install requiring just one hole. Ideal for the finishing touch of any custom project. Please note that any LED turn signals draw a smaller current than most standard fitment ones and will need suitable flasher relay in order to flash at the correct speed.